Launch of the Books – Free Download! Wow.. what a week .. 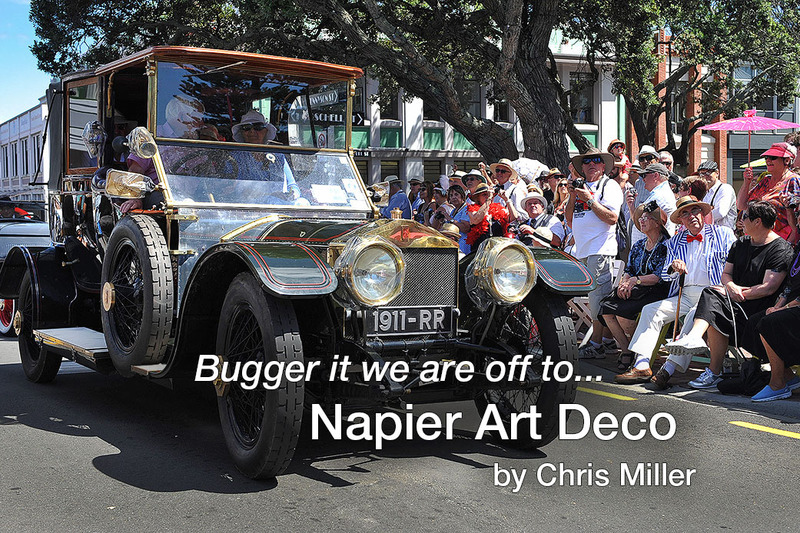 The last 2 of our Bugger it We Are Off series books were launched last week. All four are now on Amazon as Kindles EBooks. I’ve got them available in the Epub format as well for Ipads but haven’t got a Mac which you need to upload to the iTunes store.. I’ll find a way! These publications are all based on this Blog. I’m not expecting them to be best sellers but if someone out there finds a couple of things of interest in there, it was worth doing. The blurb below is copied from the OUR Books page. As a Photojournalist of some 25 plus years and a Commercial Photographer for another 20, these books are all about the images. We went to some amazing places giving me the opportunity to get some great images. 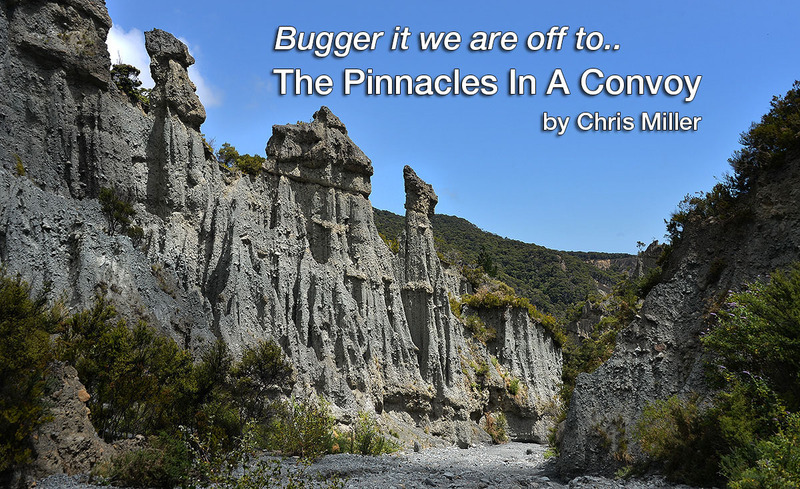 Bugger it we are off to the Pinnacles in a convoy is about meeting Motorhome friends in Taupo NZ (central North Island) and heading in our three Motorhomes down to the Pinnacles at the bottom of the North Island. 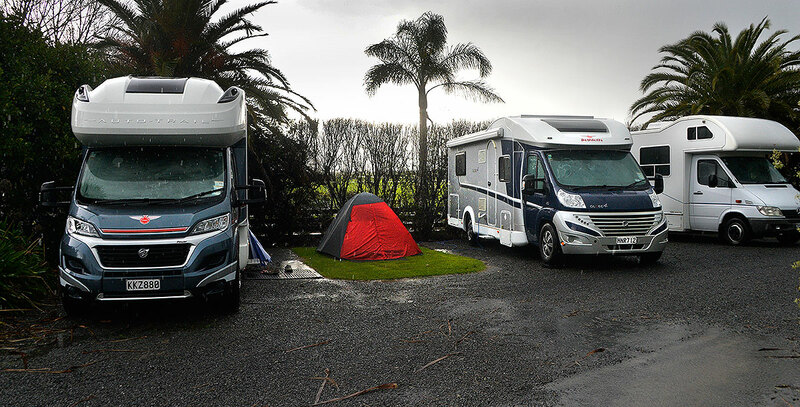 We travel through the Hawkes Bay wine region on the way, go to a UB40 concert, survive a raging storm and enjoy a great meal in an old style Country Lodge. Lots of fun and some great images. 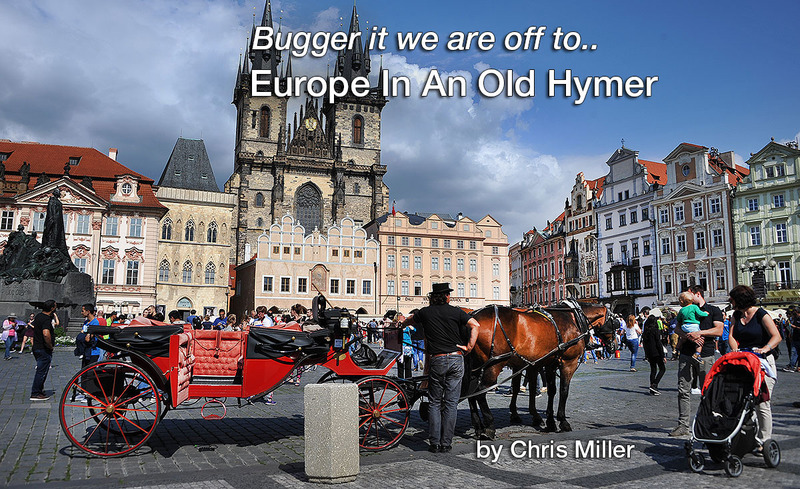 Bugger it we are off to Europe in an Old Hymer is based on our two week trip to the UK to pick up an old Classic Hymer Motorhome and then following our Motorhome friends through the Chunnel and over 5 weeks explore central Europe with bikes. There were lots of adventures and lots of laughs. A truly memorable experience. 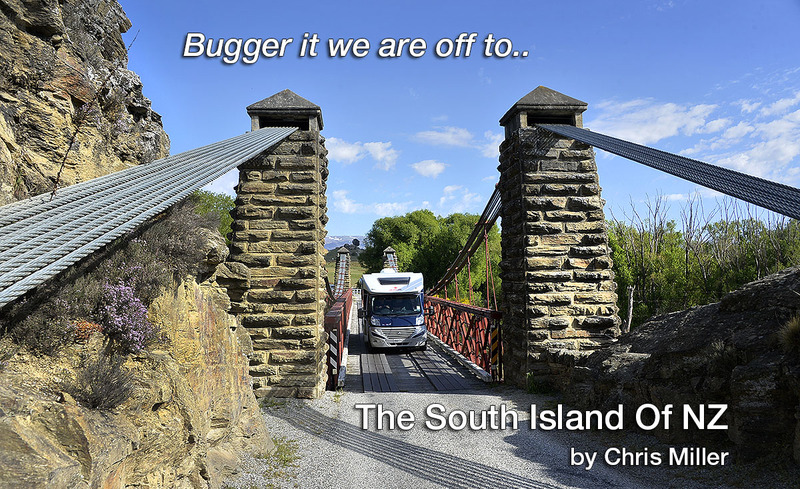 Bugger it we are off to the South Island of NZ is about our three month trip in our own Dethleffs Globe 4 around the beautiful South Island of New Zealand. We met lots of neat people, caught up with some friends and relatives, stayed in some amazing places and had a great time. Than house batteries that won’t play the game ! After 4 years of service, one of Rafe’s house batteries finally popped its clogs and a visit to the battery hospital was in order. These images are all done from a cell phone. 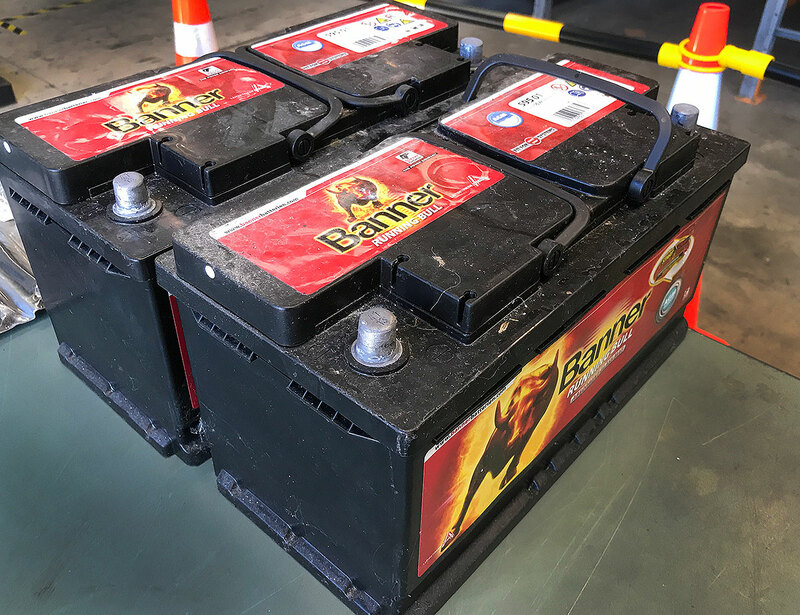 Batterytown came highly recommended by my son Andrew after he’d just upgraded our old boat Rorqual’s, new house batteries. He’d gone from 220 Amp hours to 450 odd something Amp Hours.. huge! .. plus he’d moved from lead acid to AGM’s too. 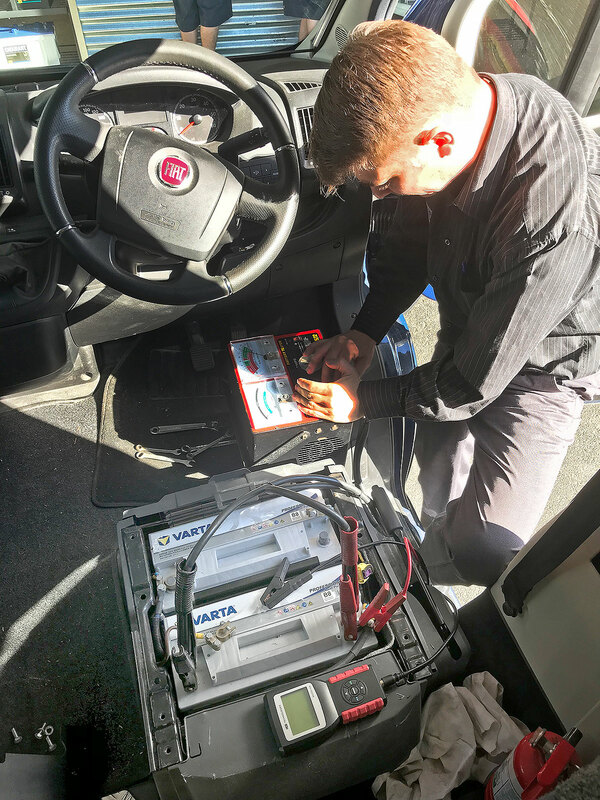 I’d been reading in some of the overseas forums that some of the British Fiat Motorhome owners had a few issues with the batteries that came fitted with some of the Fiat based motorhomes of the same age as Rafe. And sure enough, I had the same brand as well. Although to be fair, I always thought 4 years was about as much as you could expect from a bunch of house batteries. They’re not easy to get at in the Globe 4 as they’re under the drivers seat but its only a 10 minute job getting the seat out. If you’re doing it yourself as I did, be careful when you pull the seat out that you carefully disconnect the air bag and seatbelt sensor cables when you lift the seat off the pillar! Its all in one big Yellow plug tucked down the side of the seat. 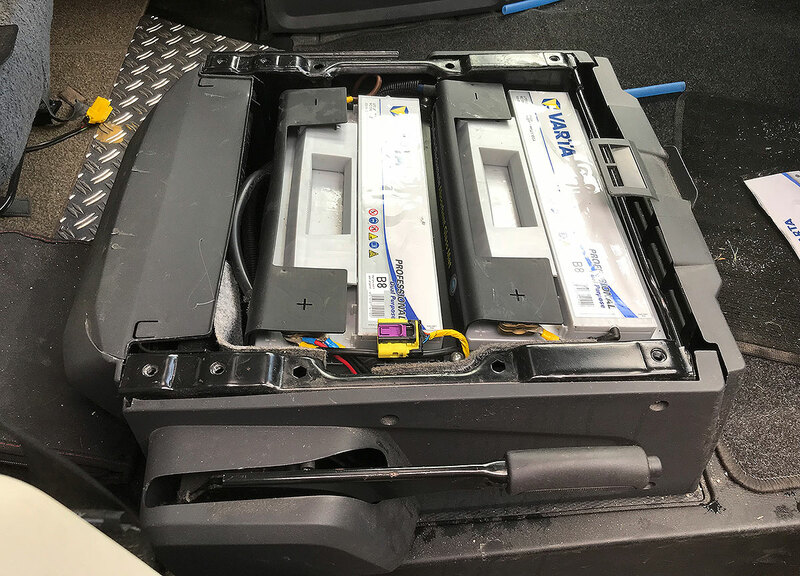 Only one of my batteries had died but you can’t put a new battery alongside an old one as the old one will kill off the new one in double quick time. 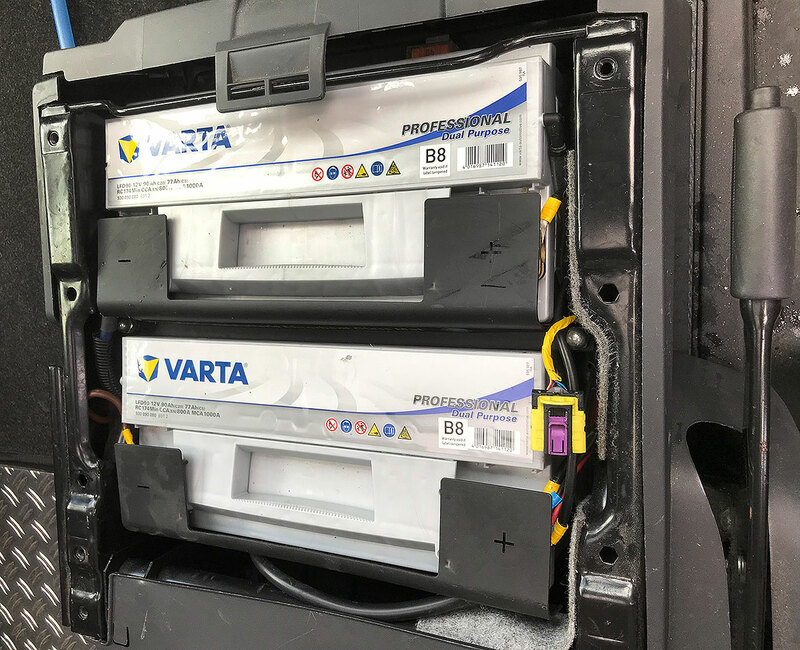 The brand that came recommended in the UK was the German brand Varta and they were getting a much better run out of them than anything else. This also was the brand that Batterytown recommended as well so I was pleased about that. Apparently they have some new technology silicone on the plates which stops the sulphation on them which stops them performing. This apparently gives them a lot longer service life and effectively increases their badged Amp Hour capacity to some degree as well. It could be marketing stuff but it all sounds good and if its working for the Brits, it must be ok. So after fitting them I was off to get them tested, just to give me peace of mind. I have in the past fitted brand new house batteries on Rorqual and found a couple over the years with dead cells straight out of the plastic wrapping ! After the load test.. from 10v up to 12.6 in a blink! 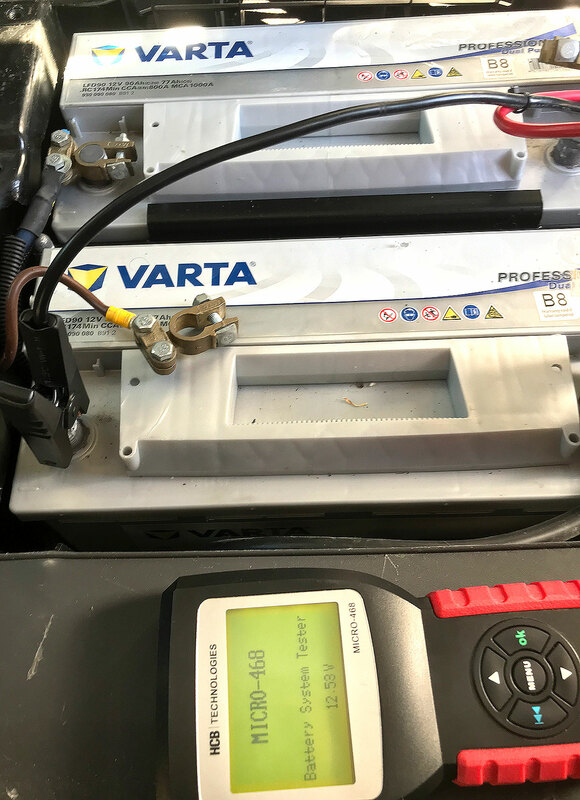 So all good.. we’re off now for another 5 or more years hopefully with some new Varta batteries. They’re also a nice white colour too. 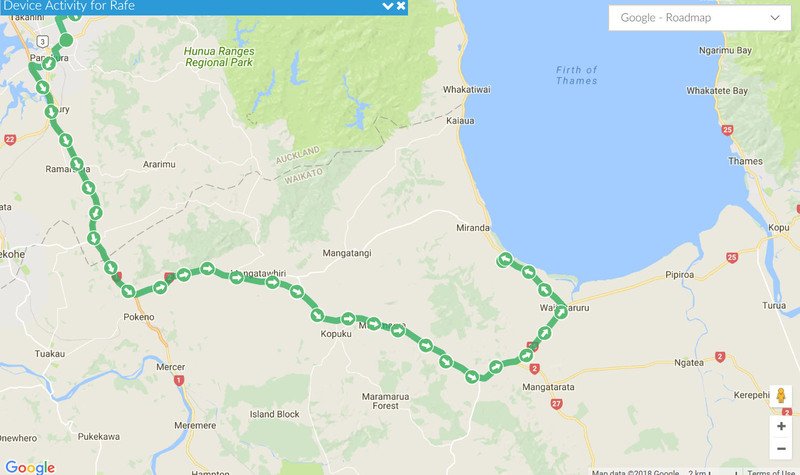 We started planning Queens Birthday quite a few weeks ago so we could book into the anticipated busy Miranda Holiday Park and get parks, for both Rafe and our friends in their Tracker. Rob, Helen and Chloe were joining us for the weekend and we were really looking forward to catching up with them again. The weekend forecast was not great but we figured that our old favorite spot would be pretty safe. 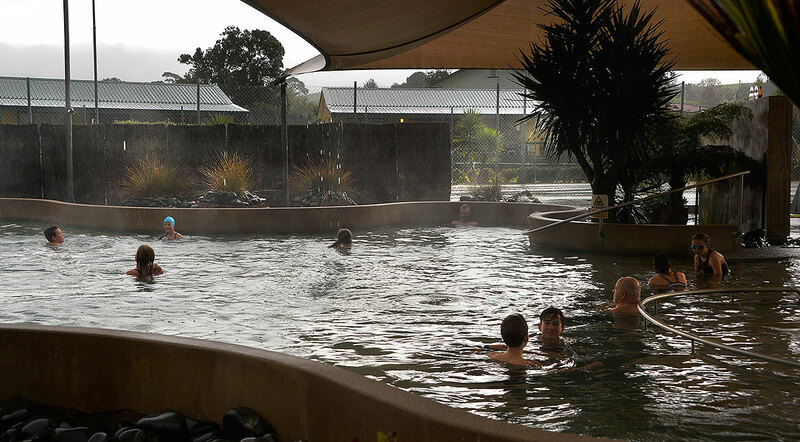 We arrived around midday on Saturday to find that Rob, Helen and Chloe had already arrived and after getting Rafe level and some vents open and the power on, Fiona and I were off to the hot pool. The rain hadn’t started yet but was forecast to arrive anytime. Later in the day, it was all on and overnight into Sunday, it just didn’t stop. It didn’t prevent us though from ducking in and out for a swim on both days. Later on Saturday, Rob and Helen popped over for a cold one and some cheese and biccies. 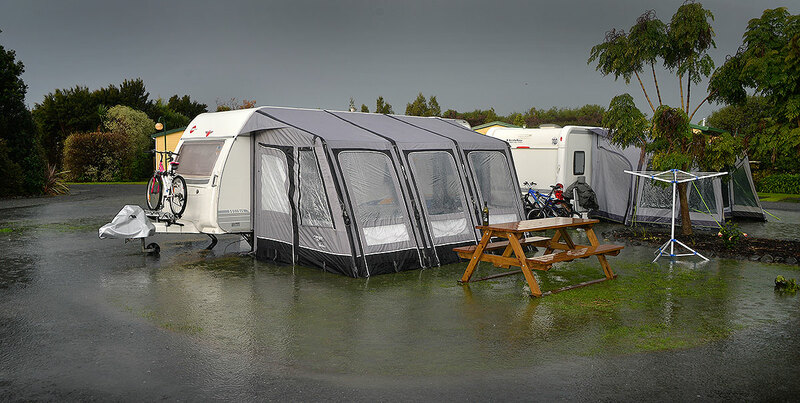 I was amazed that despite the forecast, Chloe was still keen to stay the night on an air bed in a small tent between the two vans! Sunday… It was all on, some Thunder, and LOTS of rain. The drainage ditch behind us was chocker and threatening to come into the park from the road. There was water everywhere. Later in the day, the rain eased up and Rob and I went for a walk to have a look around. 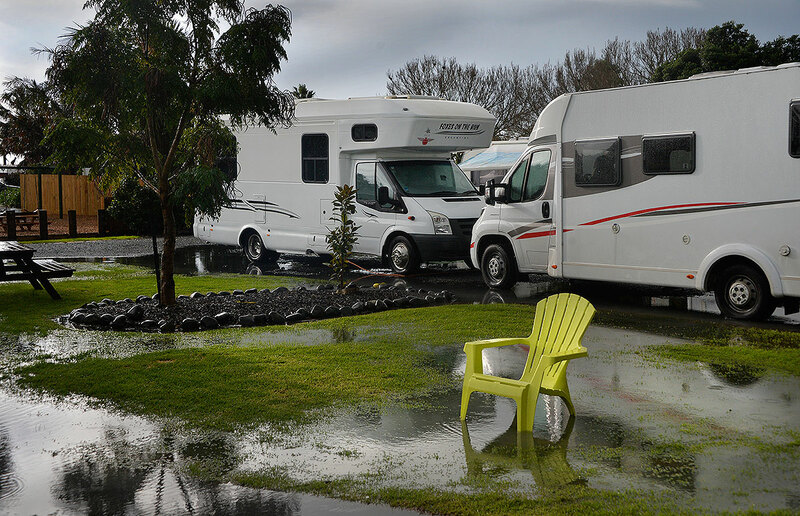 Many of the parks with Caravans and smaller vans were half under water. Most of the tent sites near us were submerged but despite all this, everyone seemed happy. 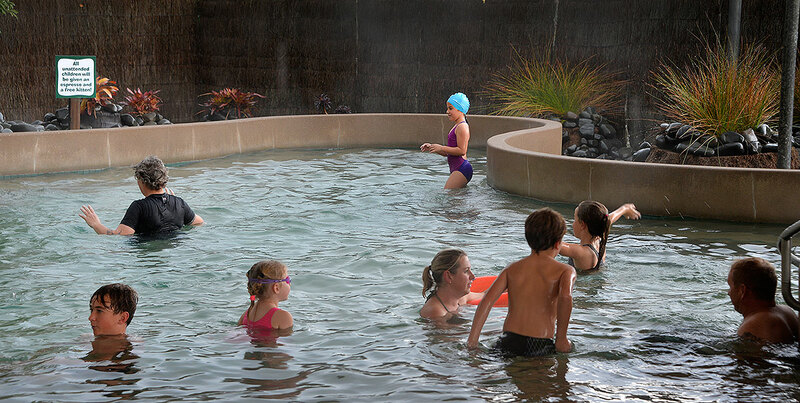 The pool was busy everytime I went anywhere near it too! A Tune Up for Rafe’s Dome and Some Smart New Technology! 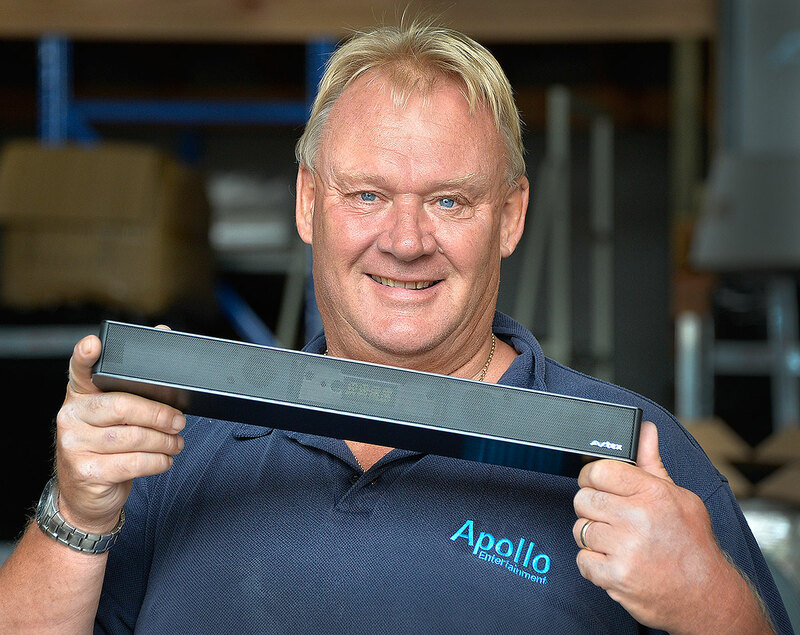 I had to pop in to Apollo TV to get my now nearly 4 year old Apollo dome serviced as I was having trouble getting some of the channels. Chris was very happy to sort it all out for me! 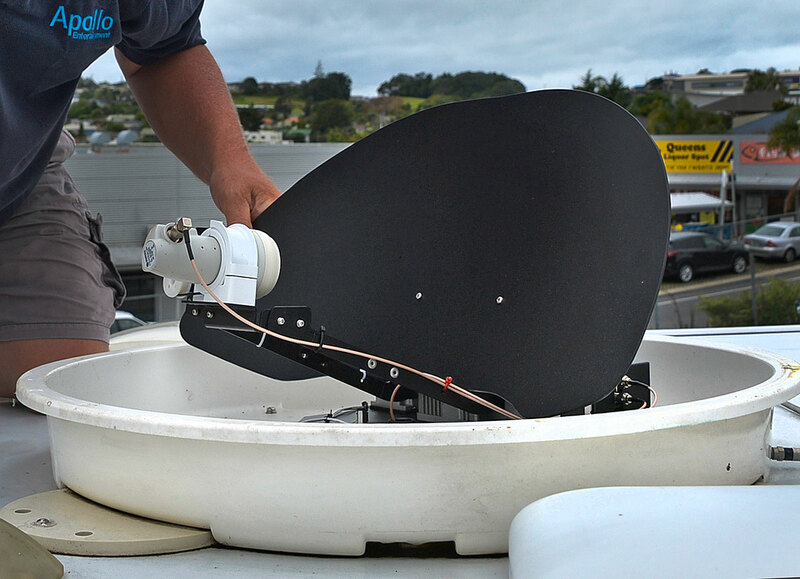 Ever since Prime moved, it has been really difficult to get and TV1 and TV2 suffered badly from rain fade where TV3 didn’t! After talking to both Chris and Duncan, I made and appointment and off I went to their office in Whnagaparoa. Nice guys that were only too happy to help me with the dome. It also turns out that my Dome cover has just about done its dash so there is a new one coming. $399 fitted. They get hammered by our high UV and get cracks in them. Mine has cracks around the screw holes on the edge so is all good for a wee while. 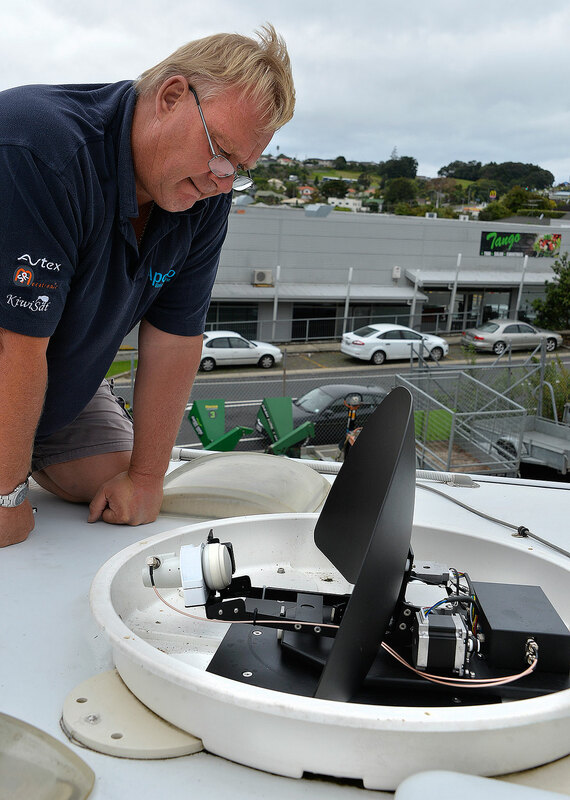 Chris got the ladder out and within 10 minutes or so, had it reset and pointing correctly at the Satellite fixing all the problems. Apparently my dome has a GPS in it to it knows where it is in the world and sets itself and the skew based on position and the signal strength as well. 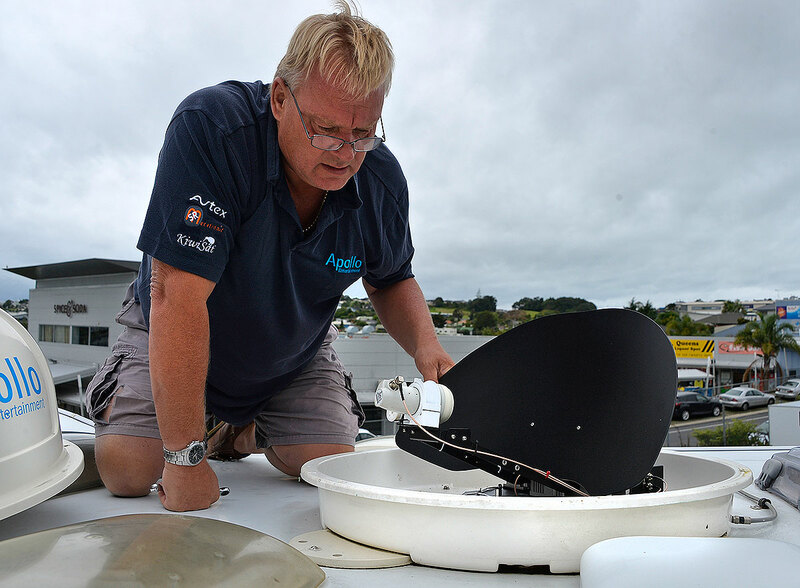 Chris was telling me that when they first starting bringing in the Domes, they realised that the Dome Cover was much bigger than the Dish so they had the Dish made as large as they could and still fit under the Cover giving us TV watchers more signal! I couldn’t get over the friendly customer service and speed at which they dealt with my wee problem. 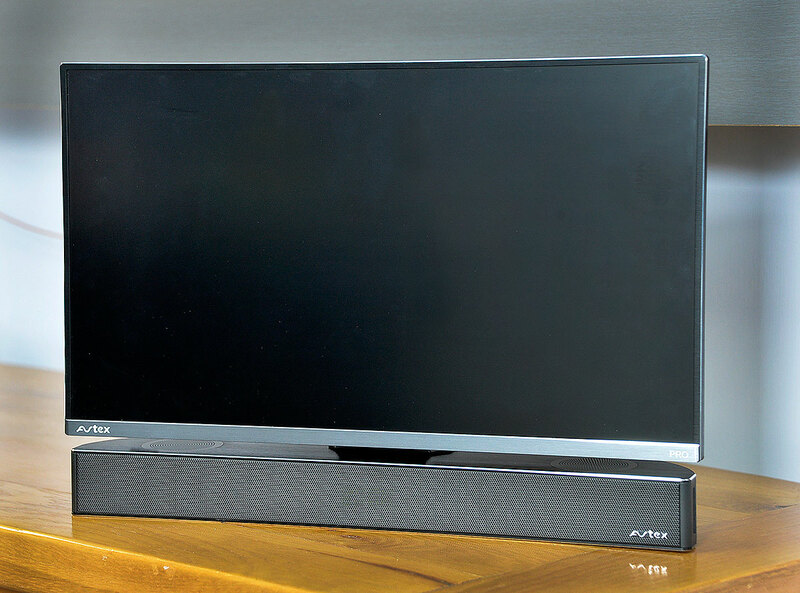 While talking to Chris, he was telling me about the new Avtex Sound Bar which fits on the bottom of the Avtex 19” TV and vastly improves its sound while only drawing .75A and they’re only $375 retail. Duncan set one up for me to have a listen and the sound is stunning. 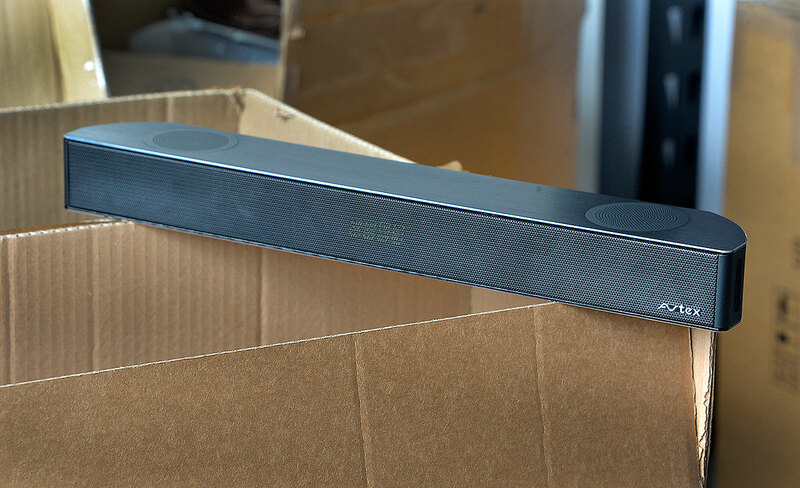 The power and sound is all sourced directly from the TV where they mount underneath. All very easy and tidy. They can also be used as a remote Bluetooth speaker for your cell phones too. Their first shipment is arriving shortly and is already just about completely spoken for! 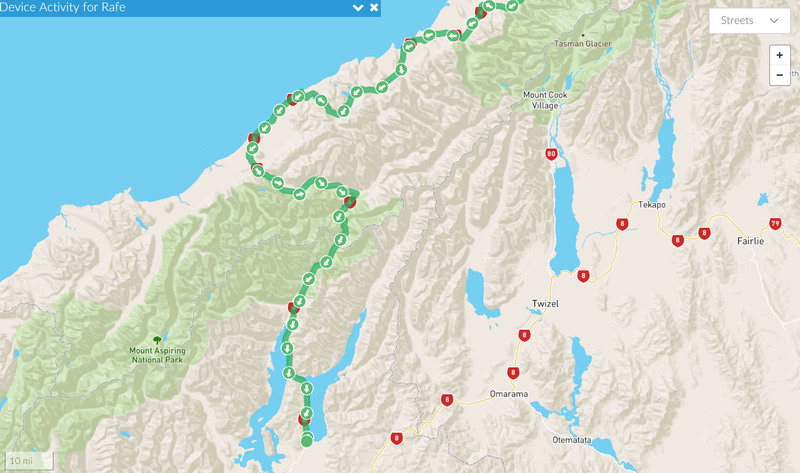 After using the superb dump station and topping up with water, we set off for Haast and the pass. It was just drizzling when we left but by the time we got to Haast, it was pouring. 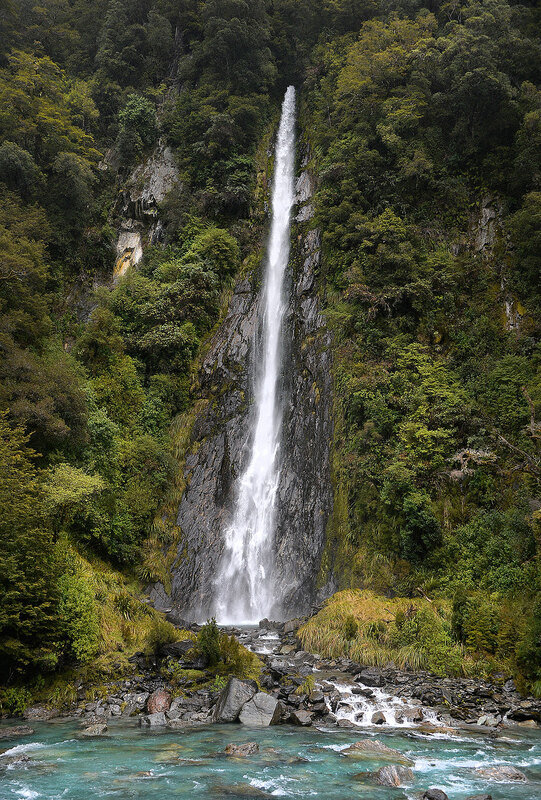 After having lunch in Rafe with some locally sourced fresh bread, we set off through the Haast. It looks great and as many said, its an easy drive, even when its raining! We stopped briefly to have a look at the Thunder Creek Falls which look amazing. The 5 minute bush walk to get to the falls is stunning. 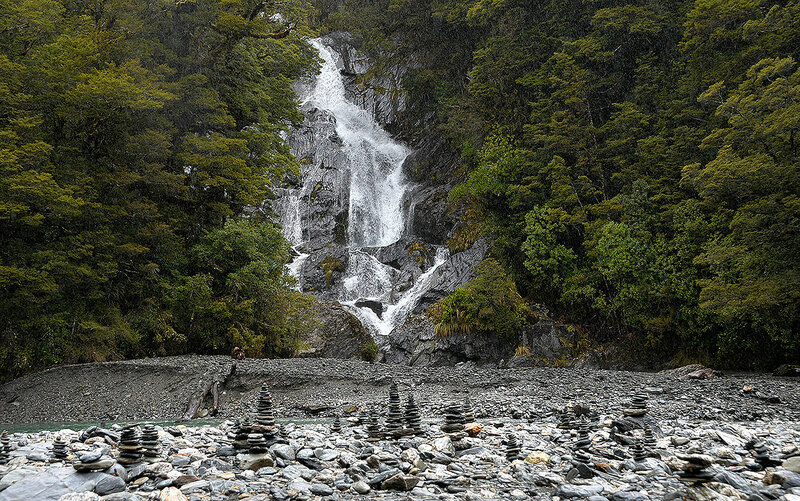 We left there and a little bit further on, we stopped off at another called the Fantail Falls where various visitors to the falls had made little stacks of river stones by the falls. The play equipment. Even a couple of old Tractors. Another nice spot and easy parking but it was still raining ! The plan was originally to stop at the Makarora Tourist centre but when we got there, it all looked a bit farm paddock like and Rafe being quite low is a bit allergic to lumpy paddocks to park in so we kept going and decided on Lake Hawea Holiday park by the lake and give Rafe’s batteries a good tweak. 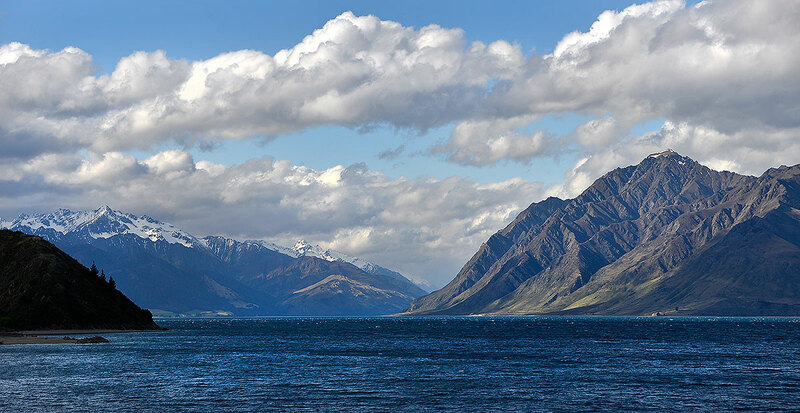 I went for a walk along the lake and had a good look around. Nice bathrooms and a Laundry and a good sized Kitchen too. We’re looking at going back there in a few weeks. 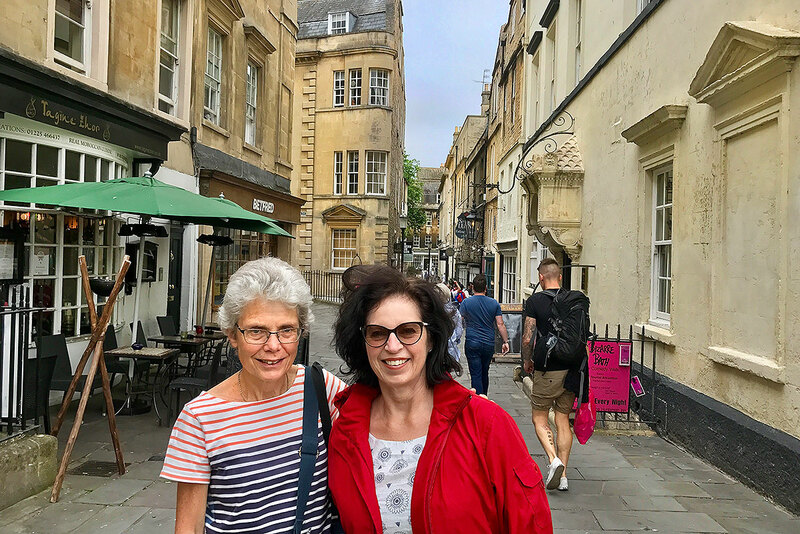 The temperature had dropped from the 30’s down to a nice 20C so we set out for a walk with Fiona’s school friend from Exmouth, Hilary. Fiona and Hilary’s dads were both in the NZ and British Army in Terendak Military Camp in Malaya when they were both about 8 years old. This was the first time they had seen each other since then so it was a real occasion for them both. 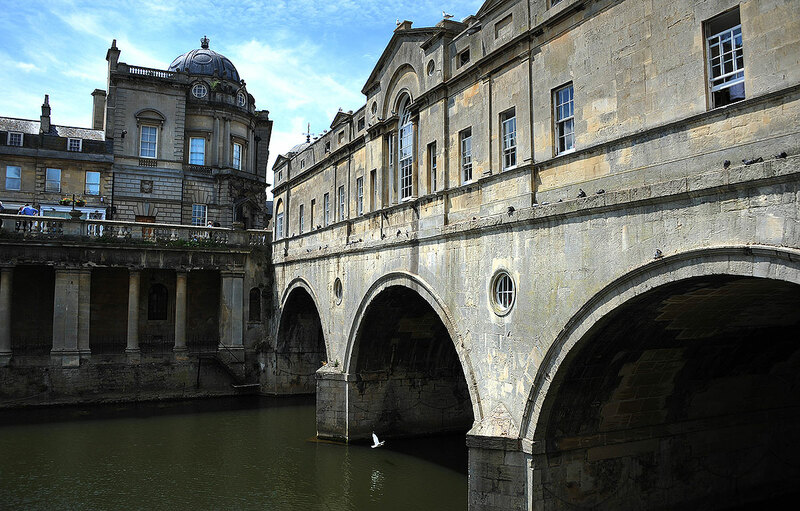 We were heading towards the Bath Bridge for a look and maybe have lunch around that way. 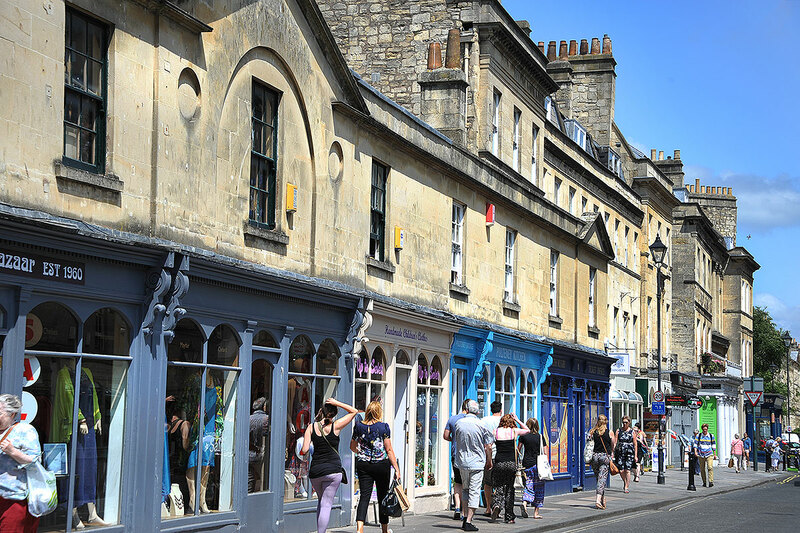 It is amazing with shops and cafes all built on the bridge over a weir and a canal so the boats can pass on the Avon river below. Stunning place. Fiona and Hilary enjoying lunch on the bridge. A refection of a cyclist riding by in the window. 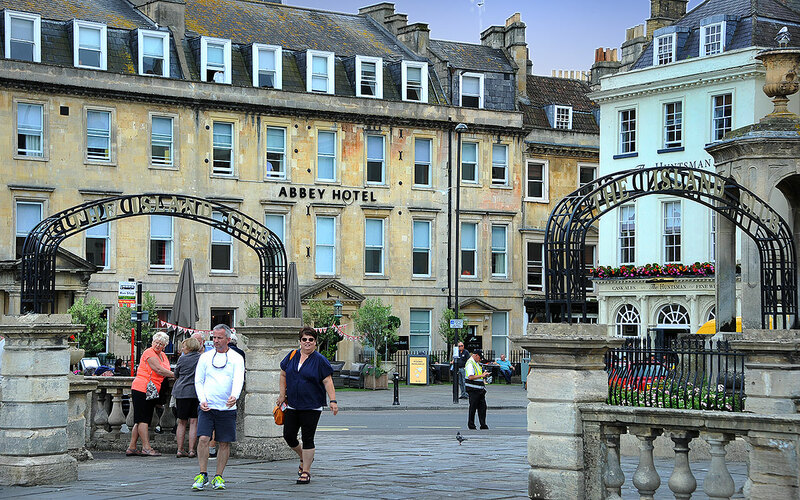 Back to the Abbey Hotel where we’re staying. On the way back to the Hotel it was really nice to see people in deck chairs and just soaking up the views and the sun. After having the carpet laid in the van by the carpet layer, we ended up with quite a lot of bits left over. I cut these up in the high wear areas, like in the Galley, by the Dining table and between the Shower and Toilet area and we had those overlocked too. The first few trips away, we were nearly driven nuts by the rugs creeping across the floor, and trying to climb or bunch up against the bottom of the walls. My first attempt at stopping this was after a trip to Mitre 10 where I bought a packet of plastic stuff for $9 that allegedly would stop this but after a trip away(the Shakespeare Park trip ), we decided we were wasting our time. So I ended up back at Carpet Extreme in Tawa Drive in Albany where I bought the carpet originally, and they put me onto some stuff called Rug Hold. You buy it by the metre (about $32 odd a metre ). I bought 2 metres and it was just enough.. Brilliant stuff and it actually sticks to the carpet like tape. It sticks to your shoes too while you’re cutting it. 🙂 I’m sure you can buy it from most carpet retailers. It’s like underfelt with glue on both sides and the feel when you stand on it, is quite different like a really flash underfelt, and you can feel too that it isn’t going to slip around. If you have this problem, now you know how to solve it ! This is a great example of why we have a rule where we park at least 3 metres apart. Every now and then a good product can fail which can be simply bad luck. We get it repaired and life goes on. When things like a fridge fails to work or fails to be useable, there are consequences like food going off or a cancelled trip. When there is a failure due to a silly design fault which lead to these consequences, there is plenty of room for an end user to be a bit miffed. 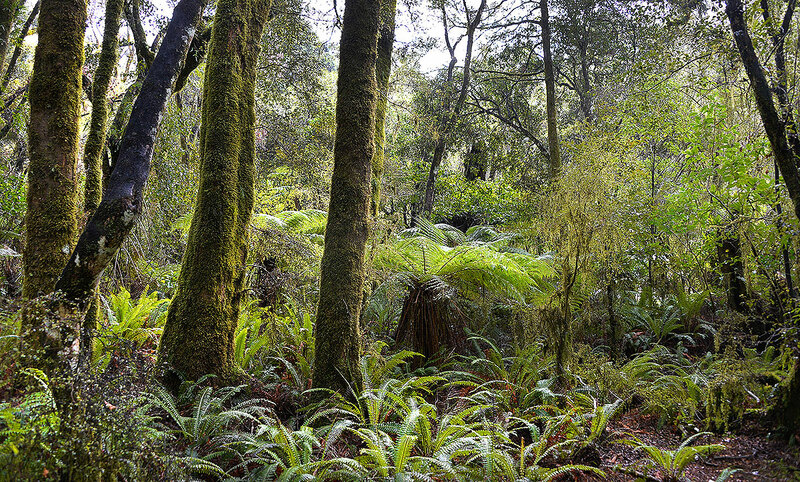 About a year ago, I was chatting to a neighbour at Uretiti DOC campground in Waipu. He had a New Euro Motorhome with the same fridge as ours and was showing me how his door lock mechanism had failed so he couldn’t open his fridge door. He ended up taking out the decorative panelling off the front so he could get to a shaft to open his door with a pair of pliers! The shaft had failed when two bits of coat hanger like wire, end on end had slipped past each other rendering the door mechanism useless. There was no proper joining shroud to keep the two bits of wire lined up. He’d gone to some trouble to show me how to get at this shaft and seemed fairly convinced, I was going to be next. This thankfully, hasn’t happened yet but I was very appreciative for the efforts he went to so I knew how to deal with it. My memory from this was how Micky Mouse, the whole setup was for a supposedly quality fridge that was more expensive than my fridge at home. Friday night was looking good to get away up north for a few days. We’d both just finished work and decided to stop at the Silverdale Roadside Cafe and BP station for some diesel and food. We’d just got going when the fridge starting beeping with a light flashing as well. It beeped for 30 seconds every 2.5 minutes. It was driving us nuts and we knew we’d never be able to sleep with it like this. At the truck stop, we turned off the fridge while we had tea and got some fuel as it seemed to keeping stuff cold, just making a racket! After tea, reading through the “book” gave error messages for things like no gas, no power and talked about other buttons beeping with the alarm but nothing for this error. It did talk about having a “door open” alarm and the “light on in the fridge” alarm. That’s what it had to be as the fridge was still working perfectly. In the meantime, we had a fridge full of food and didn’t know how to fix it. Our fridge. If you have a fridge like this and it beeps at you, you’ll know how to deal with it! We decided we’d go home, rescue the food and try again Saturday morning if we could find a fix. 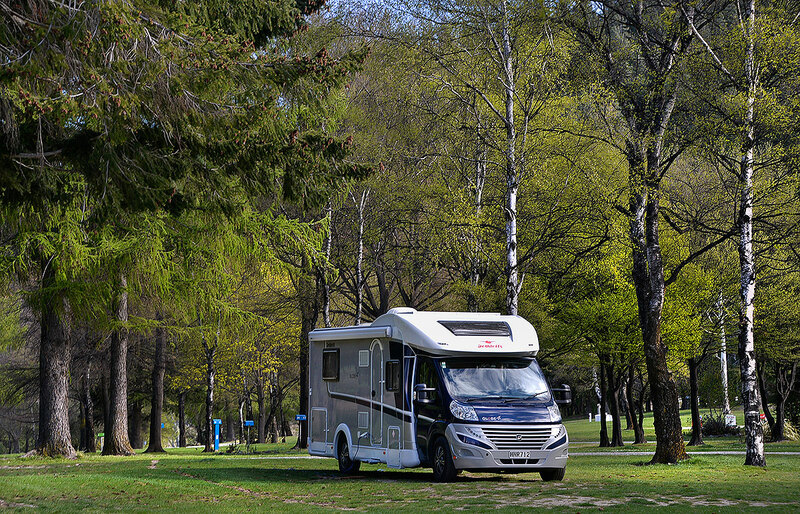 Isn’t Google great for this… “Why is my fridge beeping” gave me a list of answers from several caravan sites and they all mentioned two fridges, ours being one of them. 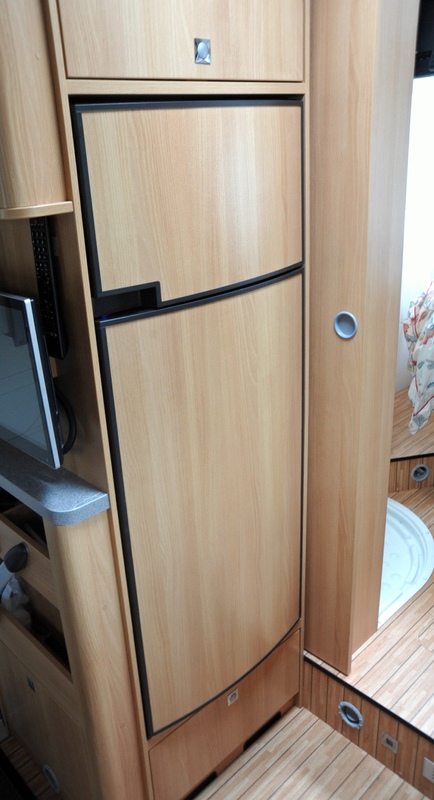 The fridge, can’t remember the model number now but it’s definitely the same as our one and they’re in all the newer bigger motorhomes and caravans. Well, the nitty gritty of it is, they have a bad built in design fault or as some call this “an undocumented feature”! 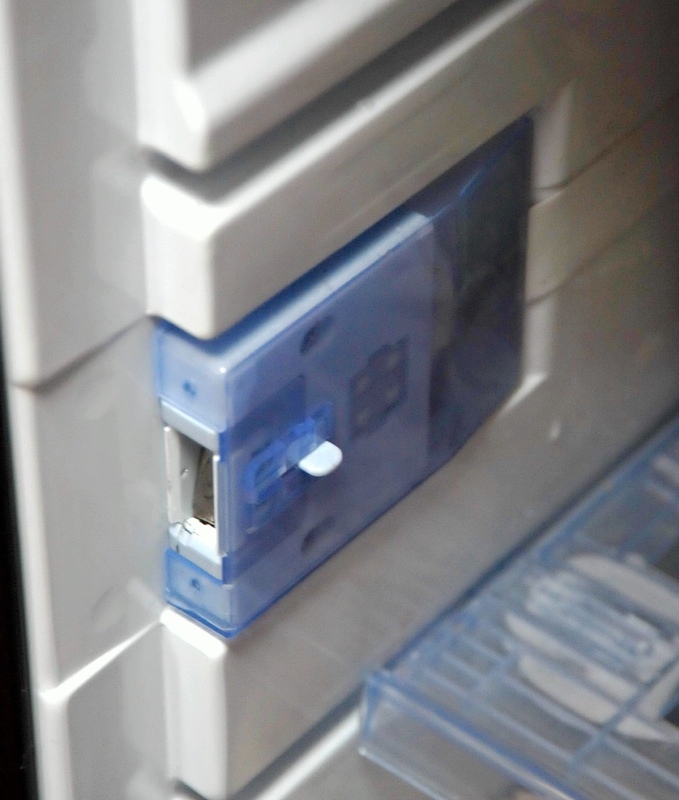 The led light is part of a printed circuit board inside the door catch assembly with an edge connector poking out the back into the fridge space. 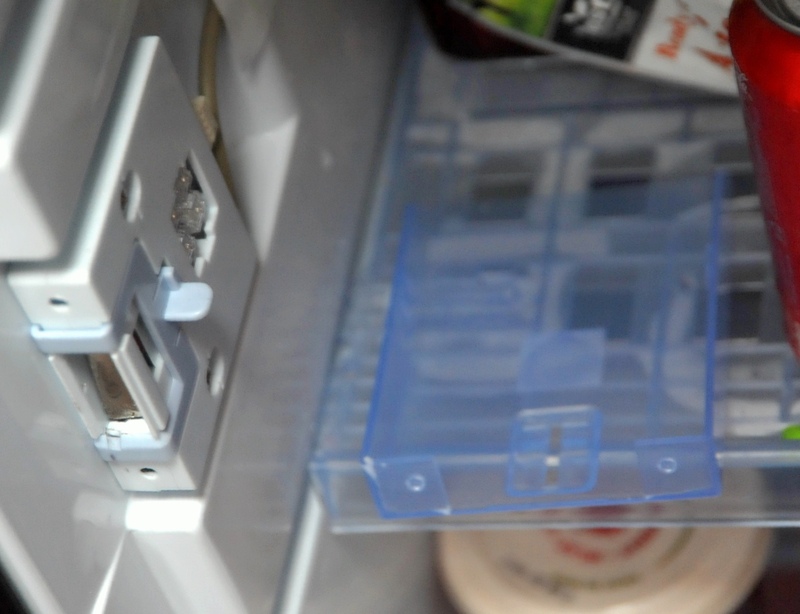 Who is the fruit loop who thought putting an unprotected printed circuit board in a fridge was a good idea? Why not give it sealed plastic cover and some heat shrink and make it reliable? Door catch with cover off with the cover on the shelf. I could see by putting my finger in the door switch that the interior led light went off but still had a faint glow so the door switch must be short circuiting by moisture. This was mentioned on various sites as well. 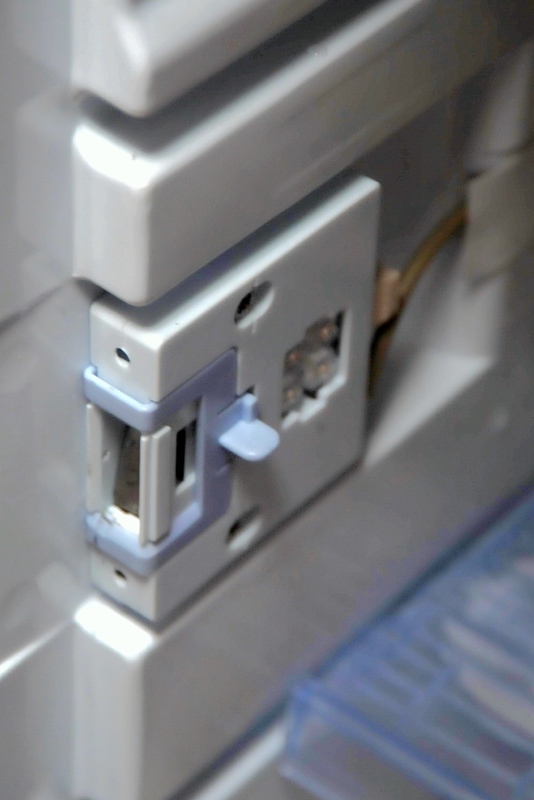 The recommended fixes from the Internet: pull the door catch cover off, wipe the plug surfaces dry and reconnect, reset fridge.. This didn’t work. Next step, disassemble again and disable the light by pulling the plug off. Yippee, success, but no light but at least the bloody fridge was quiet, works efficiently and we could sleep without the damn thing beeping all night! So we shifted all the frozen and perishable foods, cheese and wine etc back into Rafe and we finally got away at 10am. It seems I’ll have to get a new door micro switch.